A few months back we bought a Groupon for India Palace that could be used at all three locations in Chelmsford, Nashua and Manchester. It was a no brainer, the Groupon was $20.00 for $40.00 worth of food and we LOVE Indian food. With the Groupon expiring only a few weeks away, we decided to head to the Chelmsford location to fulfill our Indian craving and redeem our Groupon. The restaurant had a steady flow of customers ranging from couples of two to large group of coworkers that I assume just got out of work. The restaurant was well decorated and clean and there was a romantic ambiance with the dimly lit lights. Since the value of the certificate was worth $40.00 and the amount could not be used towards alcohol, we had to pick out a few extra selections that we wouldn't normally have had. For appetizers we started with Dakshini Crab Cakes and the House Special Platter. The Crab Cakes didn't have any lumps of crabmeat, just a few morsels and it was not served with any coconut chutney sauce as stated on the menu. At $9.99 for only 2 pieces, it was definitely a rip off! The House Special Platter was just OK, it seemed like everything was deep fried at once then plated together. I had a hard time figuring out what was what. I couldn't tell if something was chicken or cheese until I tasted it. The only thing that stood out was the over-sized vegetarian samosa. We shared Non-Vegetarian Thali combination dinner which is a traditional Indian meal served in a silver platter with Lamb Curry, Chicken Tikka Masala, Tandoori Chicken, Dal, Rice, Raita, Naan, and dessert. The Tandoori chicken was very moist and tasty, unlike most other dried out overcooked tandoori chicken offered at the usual Indian buffets. The entrees was mostly sauce with tiny bits of chicken or lamb. The dessert was obviously pre-made and scooped from a container from the refrigerator.After dinner, we were not offered tea or coffee that was advertised in the menu as part of the combination dinner. After the $40.00 credit, our final bill was about $15.00 for A Kingfisher beer and a glass of white wine. I guess the food was just OK and we probably will not be returning. This post is long overdue as I've been dying to try the new froyo shop in Lowell before it even opened about a month ago. With being on vacation for a huge fraction of that time, I finally got the chance to check it out after many Facebook Check-ins and Facebook photo updates from my friends about the Frozen Spoon. The location is a bit awkward lying on the outskirts of downtown Lowell on Dutton street. I have no problem going in that area as I frequent the seafood store and the Vietnamese sandwich shop, Hong Cuc that shares the same building, but newcomers may be a bit apprehensive at first. The decor of the shop is cute and quirky with small table setups for two and a counter with seating. Hopefully in the future, there will be larger tables that can seat crowds or can accommodate someone taking advantage of the free WIFI using a laptop and other reading materials, think Panera. A friend recommended that I try the Taro froyo, but that wasn't on today's special. I had three options, the original tart, this week's special "strawberry" and twist, a swirl combining the two. I went with the twist but I had such a hard time choosing my toppings from the black board with almost 40 toppings to choose from. There was a large range starting from the standard ice cream toppings like brownies and oreo cookies to the exotic tropical fruits and unique items like "Bursting Boba Bites" and Mochi. and the I went with the Lychee, Strawberries and green tea Mochi's. I know, how random huh? The kids chose shaved coconut and original mochi on strawberry for one and rainbow sour belts candy on original tart for the other. All the combinations tasted delicious! The original tart frozen yogurt was perfect, it had the right blend of sweet and sourness. I thought the consistency of the yogurt could have been a tad bit thicker but I'm already planning my trip back to try new combinations and yogurt flavors. Pricing was inline with the Lowell market and target demographics of teens and young adults. I thought it was set at a fair price level starting at $2.50 for a small frozen yogurt and $1.50 for 3 toppings, and only 25 cents for each additional topping. While we enjoyed our tasty treats in the shop, we saw a steady amount of customers coming and going. I didn't realized that they offer small morsels of their yogurt to sample, so that is something to keep in mind the next time there is a new yogurt flavor to try. Another customer ordered 2 Asian shaved ice. At first I thought, what's so special about shaved ice? After all, most of the other Asian supermarkets and fast food joints offer the same shaved ice with grass jelly, jack fruits, etc. To my surprise, what the girl behind the counter handed to the customer was nothing I've ever seen before. I then realized that all the toppings that were offered for the frozen yogurt was also available for the shaved ice as well. The girl got shaved iced topped with mochi's and fresh fruit. I almost wanted to be a fatty and order one to try after I finished my froyo. I resisted the urge, but next time, I will get an Asian shaved ice. A definitely plus is the frequent customer card that earns you a free medium size treat after 10 purchases! When I think of Fall, I think of apple picking and pumpkins. What better way to celebrate fall than a visit to a local farm? I took my nieces and nephew to Parlee Farm in Tyngsboro, Ma. The weather was perfect for an outing, not too hot and not too cold, in the low 80's. We arrived and were directed into the lots by parking attendants that had to manage full parking lots. Luckily for us, we arrived just before the Pat's game and the farm was starting to clear out with dads that were eager to home to watch the game. It was definitely a family day at Parlee's. The farm was full of families of all ages including infants in strollers and elderly folks with walkers. For those who wanted to pick apples, the hayride would transport you to the abundant variety of apple orchards including honeycrisps, Macouns, and Galas just to name a few. I thought the price was a bit steep at $25.00 for a large bag of apples. I assume the price is to cover all the overhead costs for the free attractions that the farm offers. The smell of freshly made cider donuts filled the air near Mary's Country Kitchen. The line was literally out the door. There was even a sign that limited customers to only 2 bags of donuts per person. I'm not surprised because they have been voted "Best Cider Donuts" in last year's NECN poll. Although I didn't get any of this visit, I've had them in the past and I vouch for them. The small delicious bites puts me in a happy place. Besides apple and pumpkin picking, other attractions include the Hay Play Area, Tractor Training (Kiddie Ride), Animal Barns. After a long plane ride back from Thailand, my sister wanted to do something nice and take the Mo and I out to eat after our arrival at JFK airport in New York. With the airport within close proximity to Korean town, we headed over to Sik Gaek. My sister and her husband had been there before and liked it. They learned about the restaurant through an episode of "No Reservations" with Anthony Bourdain that recently aired on cable t.v. The restaurant is known for serving live octopus in large table side hot pots. We did some grocery shopping at the nearby Korean supermarkets where I stocked up on Chinese sausages and cut and cleaned calamari. When we finally arrived at the restaurant, there was a sign in the front that advised, due to the season, there was no live octopus. That was fine, I didn't know how my stomach would react to it anyway. Since we were there for lunch, we were promptly seated by the funky outfitted staff with headbands and aprons. The restaurant decor was tacky but also fun. The lighting was slightly dimmed and the seating consisted of mostly booths. Immediately, we were served sunny side up eggs that were cooked table side, before we even saw the menu. The eggs were on the house. We got 2 jugs of water that were self serve. We ordered the seafood pancake as an appetizer and the seafood and rib eye hotpot along with Kimchee fried rice and beef fried rice. Everything was delicious! I've never had anything like the seafood pancake. It slightly resembles the scallion pancake but it was thicker, fluffier and filled with seafood. As simple as a fried rice dish can be, the fried rice here was extraordinary. It was full of flavor. The beef fried rice was made with shaved rib eye beef and not the usual sliced beef that is common in Chinese or Thai restaurants. The seafood/ribeye hotpot consisted of clams, mussels, shrimps, lobsters, snails, octopus, beef ribeye cooking on a bed of beansprouts and udon noodles. It was served with a side of kimchee and "Gilghuri Tteokbokki" basically seafood rolled noodles and fish cakes in a red paste sauce. The consistency of the paste sauce was similar to spaghetti sauce. The staff provided plastic buckets under the table for us to throw away our seafood shells, which was a nice touch. Since one of the waitress spilled water all over my niece, we got a free bottle of Soju, a Korean distilled beverage similar to vodka. Overall it was definitely a unique and fun dining experience! Our friend Mark introduced us to Brown's a few years ago. 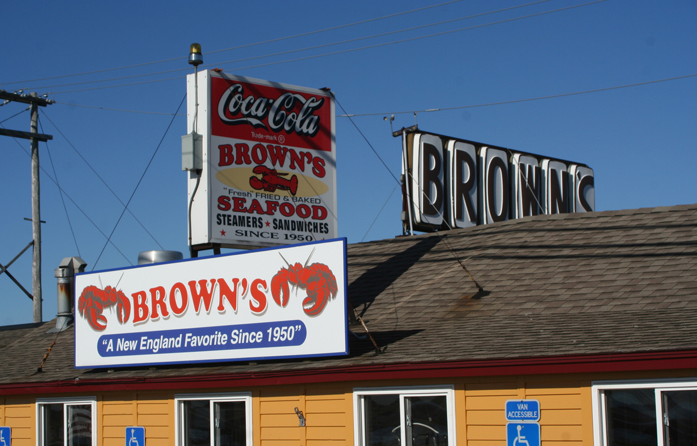 We spent the whole day at Hampton Beach and we finished it with a casual seafood dinner at Brown's Lobster Pound in Seabrook, NH. The place was packed and the wait for a table was about 30-45 minutes. They offer fresh live lobsters that you can choose the size and have prepared anyway you want. Their steams and fried seafood is also extremely popular. I did like the fact that it was B.Y.O.B so we went to the nearby convenience store and grabbed a six pack for the two of us. Since that year, it has become a tradition for us to go there at least once a year, usually after a long day at the beach. 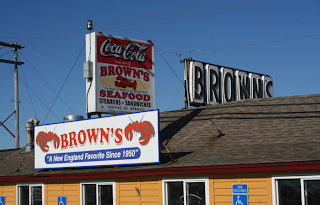 With having such a chaotic schedule this summer, we never got a chance to go to Brown's this year. To get my seafood fix, I decided to attempt at making my own fried seafood platter. I picked up a pound of scallops and large shrimps from Market Basket. I dipped the seafood into Milk then lightly coated it with McCormick's Seafood Fry Mix and set it aside for 5 minutes while my oil was heating. After the oil was heated, I fried the seafood for about 4 minutes and removed it from the frying pan. The recipe was really easy, I just followed the instructions on the batter box. 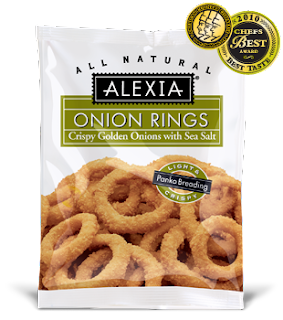 As a side, I used Alexia's Panko Breaded Onion Rings. 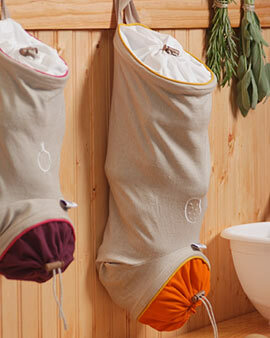 I came across these cute natural cotton and linen vegetable sacks at a local Marshalls and bought a couple to try out. 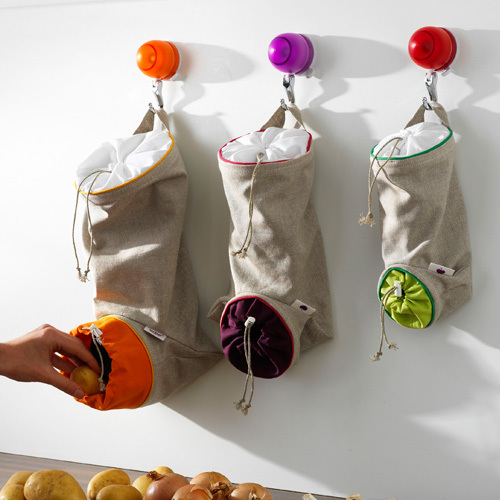 The large bags were $5.99 each but there are almost triple the price online at $14.95 each. I have a tendency to throw away potatoes and onions due to sprouting or spoilage before I get a chance to use all of them. Since I usually store the potatoes and onions in my "cool and dry" lazy susan corner cabinet, I tend to forget I have them. When I do need them, the potatoes and onions are usually in pretty bad shape. I just got 2 of the large bags, one for potatoes and the other for onions since I usually have an assortment of red onions, vidalia onions, and the common onions. I do like that its machine washable so I can wash out any rotting liquids if I do forget the vegetables in there for a longer period of time.